LOL, Harry Truman would disagree. He felt your personal values should be reflected in your public policy. As for me, I definitely have Roman Catholic values on Sundays for about an hour or so. Of course, since I don't work at Chik-Fil-a, I can't always make it. But that's okay because the Catholic Church doesn't expect one to be Catholic ALL of the time. Else wise they might actually excommunicate some of these public figures. "Our country is founded on pluralism. The First Amendment defines our most sacred freedoms, including freedom of the press, freedom of speech and freedom of assembly. But the first one listed is freedom of religion. We cannot have true freedom of religion without separation of church and state. And the country cannot function if religious officials are dictating policy to elected officials." This is a philosophical issue, often becoming ideological. This is the Enlightenment speaking upon which USA was founded. Until V2, calling for strict separation of Church and State was considered the American Heresy by the Church (see Syllabus of Errors #15 and #78). The Church of V2 would now be in agreement with what Mr Cuomo said. Certainly not the SSPX, but, then, V2 is the sacred cow of the new pentecost Church which trumps all doctrines of the past. The problem with this State vs. Religion conflict is that the State itself becomes a religion when it enters the sphere of moral judgements founded on Reason as the godess. What part of sinning in "thought, word, or deed" does he not understand? His deeds count. What a ridiculous man. As if God is fooled. As if you can separate your deeds at work from your very self. I have lost all hope in Cardinal Dolan. I used to have such great respect for him and as a former New York (Long Island) resident we would often travel in to NYC to catch Mass with him but that respect is now gone. He's just another shill with his hand out. If and until he and others in such his position take real, public, and unapologetic action against Cuomo and his ilk, I will take myself and my money elsewhere. "I'm out"
ps: I always viewed Dolan as a buffoon, yucking it up with Abortion King, Obama, at the Alfred Smith Annual Dinner. 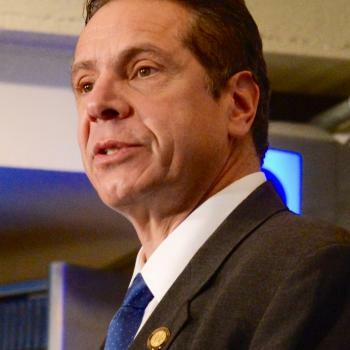 Cuomo will never receive any censure, because the American Catholic Church is nothing but the Democrat Party at prayer (in their minds, at least, although they don't know the Dems are now the party that boos God). The hierarchy will support the Dems no matter how Godless they have become. Look at how Cardinal O'Malley lionized Senator Ted Kennedy, pro-abortion renegade, at his funeral... Cuomo is a Catholic "in good standing", don't you know, as Cardinal Dolan said before.